August | 2017 | LIT.GAZ. I know there are people who only ever read books once; there are books I only ever read once, but, as many of my readers will know, there’s greater and added pleasure in going back to a favourite novel over and over again as the years go by. Every time, there’s something different that we can latch on to, observe, follow, and our appreciation of an author is undeniably enriched by such re-reading. I can remember introducing this idea to students at school, pointing out that our first read-through of a novel is inevitably plot-driven, as we are keen to know what happens, and how everything turns out; when we know that, we will slow down and be capable of noticing different things on a second and further subsequent reads. Clearly, this is also a helpful tactic when it comes to revision. And now I find myself victim of that first read, gripped by a novel so that I’m conscious of cantering through it, and aware that I’m missing quite a few things, but at the same time happy with this in the knowledge that I’ll re-read the book again soon, more slowly and carefully. That novel is Ursula Le Guin‘s Malafrena, which I should have read years ago and have finally got around to. It’s not a science fiction or a fantasy novel as one might have expected, but a historical one, and I’m keen to see where she gets with both plot and characters in a novel that’s far from predictable. I’ll write about it when I’ve finished. So, this ex-teacher and something of an expert on literature is, in the end, no different from any other reader, despite my knowledge and skill-set: plot grips me just like anyone else. And, preparing this post, I remembered other books I’ve raced through: all four books of Philip Reeve‘s Mortal Engines series – it’s time to come back to them – and both of Anthony Horowitz‘s Sherlock Holmes pastiches, both of which I re-read within weeks, Harper Lee‘s Go Set A Watchman, which it’s also time to go back to and reflect on with a bit of hindsight. And, of course, when the new Philip Pullman comes out early in October, I shall have my copy on Day 1 and set aside everything else to rattle through it… can’t wait! Writers often go to great detail in their description of settings – the territory, place, town, building in which their story takes place. Some of us value the depth and the care they take, although I recall from my teaching days that students quite often complained that ‘there’s too much description’; they wanted to get on with the plot, and I realised that in our primarily visual age, with its action-packed plots, they were frustrated by the slow pace of such passages in a novel. But, how does your imagination work when you engage with an author’s descriptive passages? I almost invariably find that my imagination superimposes the setting of a novel located in an unfamiliar place onto a landscape which I am already familiar with whenever it can: it will use my home town, school campus, or holiday destination I’m familiar with, and merge or blend in the details as and where possible. In other words, somehow, the stored stock of images and memories of a whole lifetime is being called upon to configure the setting for a novel or story… Sometimes I’ll be conscious that this is happening, and other times once I’ve built up a description in my mind, I’ll suddenly be reminded that I’ve modelled it subconsciously on where I went to school, or something like that. This doesn’t always happen: I don’t have personal stock images of the Antarctic or the Sahara, to pick a couple of examples, but even then my imagination will try and use smaller stock images to fit descriptions of buildings or rooms within such settings, for instance. I’ve realised I have no recollection of discussing this with anyone. Do I have a lazy imagination, or does everyone’s work in a similar fashion? When I think about how terrorism has been portrayed in novels I’ve read, I instantly go to Joseph Conrad, whose The Secret Agent is the best example I know. Written a century ago, it’s still a masterpiece of the suspense genre, as Conrad uses his technique of non-sequential narrative to great effect. So, from the outset we know there is a terrorist outrage in London, but we don’t know who carries it out, or the consequences, until much later in the book, and it’s the narrowing gap in our knowledge that draws us ineluctably and frighteningly forward. It’s hard to say much more without ruining the plot, so I won’t… but the interplay between the plotter and his wife is marvellous. The time when Conrad was writing was the epoch of nihilism, as well as that of plots against the Russian monarchy, so terrorism and its consequences rears its head in other of his novels, too, perhaps most notably in Under Western Eyes. And Conrad’s attitude to terror and what it seeks to achieve seems to mirror ours today: the perpetrators are warped and deluded people, devoid of conscience and humanity, expecting their outrages to change people’s minds and bring about some kind of momentous change, which it never does: the innocent die and life goes on. If our minds unconsciously turn to the Middle East when someone mentions terrorism, then perhaps we should go back further in time, reflecting on the Western interference in other nations’ affairs, which is allegedly the prime mover for many of today’s attacks. In the Sherlock Holmes canon, John Watson is an ex-army doctor who has served in Afghanistan and been invalided out because of an injury from a ‘Jezail bullet’. So we’ve been interfering in that country for a century and a half, and still haven’t learned our lesson. In Naguib Mahfouz‘ brilliant Cairo Trilogy, for a vast part of which we are unaware of British rule in Egypt, a demonstration against it suddenly intrudes with powerful and tragic consequences when the beloved son of the family is killed. Remind me again, exactly why the British were ruling Egypt? I’ve mentioned before how much of the world that was open to us to travel in my younger years is now closed to us because of the risks and dangers: no more hitch-hiking along the hippy trail through Iran, Iraq and Afghanistan to India. And it’s rather more perilous for travel writers to make their way through such countries, too. Gone is the physically arduous but not politically risky travel of the 1930s; people still make their way through the territory, but always looking over their shoulder, aware of the possibility that some group may find their presence unwelcome and challenge it, or worse. I know that hindsight is a wonderful thing, but I can’t avoid the knowledge that the world is a dangerous place largely because we in the West think we have the right to do what we please where we please, economically and militarily; equally, it’s perfectly possible that if we weren’t behaving like this, maybe some other nation would. Lines we drew on maps over a century ago are still wreaking havoc on lives in the Middle East and by proxy here at home, and it seems to me that very few people are minded to ask the right questions about what should be done. This novel was apparently written in a few weeks, based upon the diaries of a woman who had served as an ambulance driver on the Western Front; it appeared a little while after the much more well-known All Quiet on the Western Front by the German writer Erich Maria Remarque and was intended as a version of this novel from a female viewpoint. Certainly the similarities are noticeable. But it stands very much as a powerful, if little known work, in its own right. It shocked me when I first read it, and has lost none of that power. Women were recruited as volunteers to work in various roles near or at the front; nursing and ambulance-driving were the most perilous because they meant being very close to the action. Many middle-class and upper-class women served, and they saw at first-hand the products of mechanised warfare; they cared for and tried to repair broken men; they were fully aware of the horrors. We follow the transformation of a respectable English woman, shocked by what she has to deal with and also the unbridgeable gulf between what she sees and knows and what the do-gooding matrons back home with their committees imagine. Here she is as determined as Siegfried Sassoon to let everyone back home know the reality, and the hypocrisy, even though we are more than ten years after the end of the war. The bitterness comes across even more strongly than Sassoon’s, and the overt anti-war stance and criticism of politicians extends even to some of the young men due to go into action. Behind the scenes everything is about keeping up appearances, whilst sexuality rears its head and lesbianism lurks in the background; this last is a little muted and some critics have accused the writer of seeking to normalise the heterosexual: this may be true, and the context is complex, and also not what I’m interested in here. What does come across is the extraordinary pressure on both men and women when so close to the possibility of death: the narrator’s sister has to procure the money for an abortion, and the narrator herself chooses to sleep with an officer heading to the front lines the next day. Later on in the novel she learns that her fiancé has not only been blinded and lost a leg from the hip, but has also been emasculated. 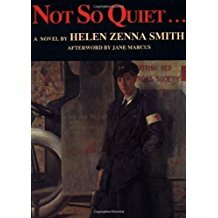 There is a feeling – partly from the hectic pace of the novel and the nature of the narrative style – of great honesty in the narrator as she shares her experiences and feelings, including the death of her friend in an air-raid, and she raises the question of what is to become of her once the war is over. I mentioned similarities with Remarque’s novel earlier, and this is one of them: in All Quiet, Paul wonders what his generation will be like after the war; he is never to find out, of course, although the author does explore the lives of those who returned. There is also the return home: Paul returns on leave and hates it because he has nothing to say to those back home, who are incapable of understanding; so too the heroine of Not So Quiet, who is sent back home on sick leave, and clashes with parents, relatives and all those who are ‘doing their bit’ to support the ‘war effort’ without knowing what that actually entails. Women like her are mentally and emotionally destroyed just as the men are, even though they may have missed out on the actual fighting in the trenches. Ultimately everything is taken from her, and although I rate All Quiet as probably the most powerful and effective novel that came out of the Great War, there are enough punches to the gut in this book to make it a worthy challenger for the title. Inevitably I pair Owen with Sassoon, in lots of different ways. Sassoon was Owen’s mentor at Craiglockhart, and in so many ways the pupil outshone the master. That’s not what I’m really interested in, though; what catches my eye and ear are the similarities and the differences, given the closeness of their experiences. And my writing about my chosen Owen poems over the last few days has called this particular one of Sassoon’s back to my memory, because it’s one of those where Sassoon seems to me to come closest to Owen’s way of writing. The pace of the poem is slow, matching the painful trudging up to the front to repair the wire: lengthy lines and occasional incomplete rhymes develop the effect. Present participles ‘sliding… poising… groping‘ show us the difficulty of moving, as do long vowel sounds ‘lurched…pawed‘. He uses alliteration ‘peered…puffing…point‘, ‘swallowed…sense…sight…stooped…swore…sagging‘ – why? Two sections set the scene in considerable detail. I’m reminded of Owen’s The Sentry here, too. Then all is illuminated – look at the long ‘i’ sounds in ‘shining whiteness‘ – and then the flare dies out: ‘the slow silver moment died in dark‘. Onomatopoeia echoes the rifle-shots through short, sharp vowel-sounds: ‘split…crack…sing‘; how do shells come ‘calmly‘? and burst with ‘hollow bang‘? I’m really aware of Sassoon using the language to its fullest extent, in terms of poetic techniques, in the same way as Owen does, in this poem. Somehow the man is killed: look at the stresses ‘now…never‘, and the now is at the start of the line and gets extra emphasis from its position. Depersonalised in death: a ‘jolting lump‘, and then humanised again briefly: ‘beyond all need of tenderness and care‘. Then we are into the second half of the poem and Sassoon is magnificent here. Like Owen, the focus is on a single individual and that’s where the full power of the poem comes from, just as in The Sentry, Dulce et Decorum Est, or Disabled especially. It’s the ordinariness that Sassoon stresses in his detailed description in the fourth stanza – a ‘decent chap‘, looking forward to a drink and a sleep; again the alliteration makes this more appealing ‘draughty dug-out‘, ‘frowsty…fumes‘. The final stanza is slow-motion until the suddenness of the last two lines, with the effective combination of the rhyme ‘head/lead‘ and the alliteration of ‘split… startled‘ and ‘life..lead‘ and the permanence of ‘all went out‘. Although Sassoon does the bitter and sardonic very well in lots of different short poems where he rubs his readers’ faces in the horrors that they don’t know and can’t imagine, I find him much more moving and effective in longer poems where he takes the time to create a sense of time, place and atmosphere, and makes us care about the fate of an individual, just like his pupil Owen; in a war where casualties are counted in telephone numbers, we need this personal angle to draw us in and make us realise the full horror. A very low-key poem, this one, and another of my favourites, but for personal reasons. I’ve tracked Owen’s life and death over the years: he was born in Shrewsbury, which is where my other half comes from; in fact the Owen family home was not that far from hers. So I’ve visited the Abbey many times, in which is the original war memorial from straight after the Great War. The huge tablet on the wall lists the fallen of the Manchester Regiment among others, and Owen’s name figures there. And then in the Abbey grounds is a more recent, rather brutalist monument commemorating the attempt to cross the Sambre Canal, where Owen was killed. I’ve visited the Maison Forestière near Le Cateau Cambrésis in northern France, which is the house in the cellar of which Owen spent his last few nights alongside his men and from where he wrote his last letter home; it’s been turned into a a very moving memorial installation. And then there is his grave, one among dozens of others all killed that same day, in the nearby village of Ors. And for a good number of years I lived in Ripon, which during the Great War boasted a huge army camp, larger than the city itself, where Owen spent his last weeks in England, recuperating, training and polishing his poems, living in a small rented cottage near the river. From its ‘upland camp’ he headed back to France and eventually, some weeks later, to his death. The pace of the poem is noticeable: does it echo the tired march of the men on their way to war? Alliteration makes itself felt from the start. And think about the conciseness of the phrase ‘grimly gay’, how much more powerful it is than talking about putting a brave face on things… Positioning of words can be important: look at the way ‘dead‘ ends that first stanza, at the end of a half-line, so we are brought up short as we notice it, and it gains extra power from the rhyme with ‘shed‘ – maybe we’ve anticipated the word? no less powerful if we did. Owen creates the banality of the situation. We need to recall the excitement and the cheering crowds of 1914 to get the force of the contrast: here it’s evening, the porters are ‘dull‘, the tramp ‘casual‘ and already missing the free cigarettes. The railway signals, personified in silent conspiracy against the men, are particularly chilling: ‘unmoved‘, ‘nodded‘, ‘winked‘: it’s all so casually done, because done hundreds of times before; we are in 1918 now, remember. The men are anonymous, ‘they were not ours’. And the final stanza has an air of prophecy about it, the few that will return, the poet not among them. I’ve always found the story of Owen’s parents receiving the telegram announcing their son’s death on the day everyone else was celebrating the Armistice unbelievably sad. It matches that chilling sequence in the film O What A Lovely War which reminds us that someone had to be the very last soldier to be killed and takes us through that scene… Those who returned ‘creep back‘ – why? so marked and scarred by their experiences they wish to hide, remain unknown, undisturbed? Their lives will never be the same again. And I’m reminded by how skilfully Sebastian Faulks captured some of this mental and emotional trauma in Birdsong. So, that was a few of my personal reflections on several of Owen’s poems that particularly speak to me. This is, to my mind, one of Owen’s more obscure, or at least less accessible poems today, especially for students, because hardly anyone goes to Sunday School any more or is familiar with the Old Testament bible stories that are (or used to be) part of our cultural background, if not more – the story of God’s testing of Abraham, ordering him to sacrifice his own son Isaac as a test of loyalty. Let’s leave aside as irrelevant to our purposes the kind of God that would put anyone through this kind of charade, and focus on what Owen does with the story, which would, of course, have been instantly familiar to all his readers. You need to read the story in the King James Bible; that’s the version Owen would have known and the language and syntax of today’s Tesco translations won’t make half the connections you need. So go to Genesis chapter 22 and read the story first. Then see how Owen follows the bible story only so far before it begins to warp, to unravel, to develop a mind of its own. There is no ‘fire and iron‘ in Genesis, but there was on the Western Front. Abram bound his son ready for sacrifice, but not with the ‘belts and straps‘ of a soldier’s uniform and kit; he built an altar, but no parapets and trenches: these details of war creep in, in an almost hallucinatory distortion of the original story. In Genesis, when Abram has passed the test, the angel of the Lord does appear and save the boy; there is the ram caught in the thicket for a substitute sacrifice, which the dutiful Abram offers to God… but not this Abram, who flies against God’s command, kills his son anyway, and half the seed of Europe. Subtle in its development, if not in its message, Owen calls the war and its effect on future generations into question, and suggests to the reader that it is morally wrong, not what God would have wanted. And yet, this did not stop him from serving his country or doing what he perceived to be his duty to his men, right up to the very end. It’s a simple poem from the perspective of language: no fancy assonance or half-rhyme, just a bitter twist on a story his readers would have been familiar with, and perhaps all the more shocking because Owen chose to meddle with a story from the Bible.